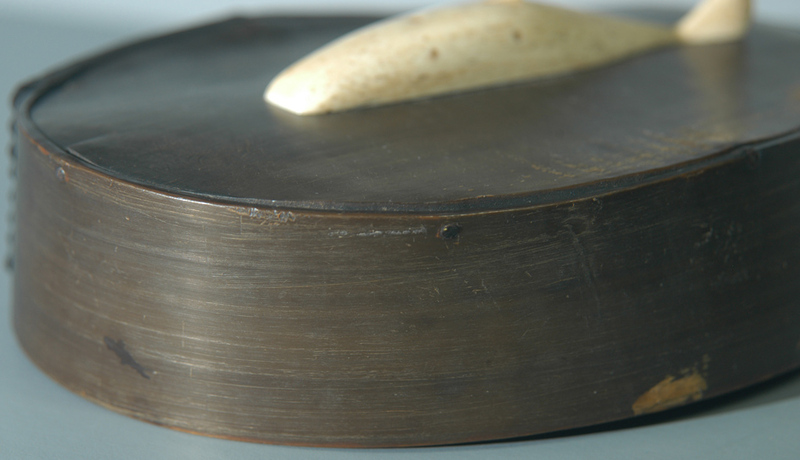 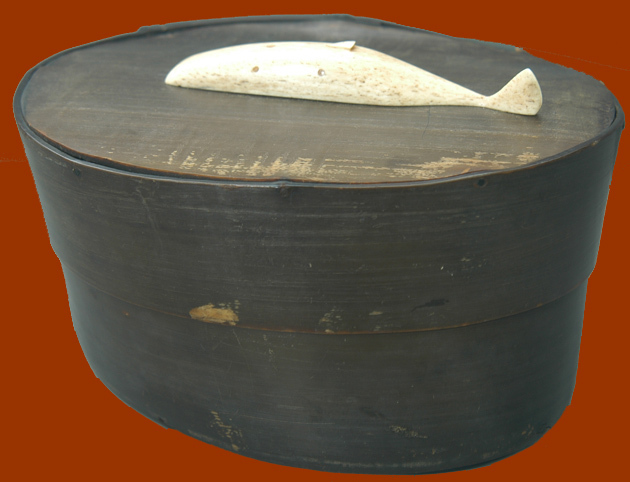 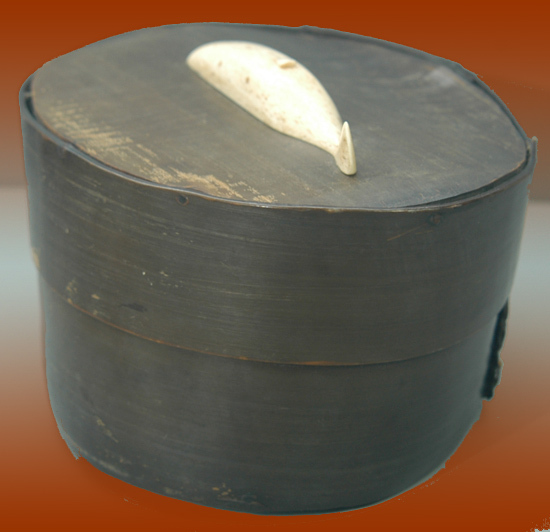 This great oval box is laced together on the sides and the top and bottom are pegged with wood. 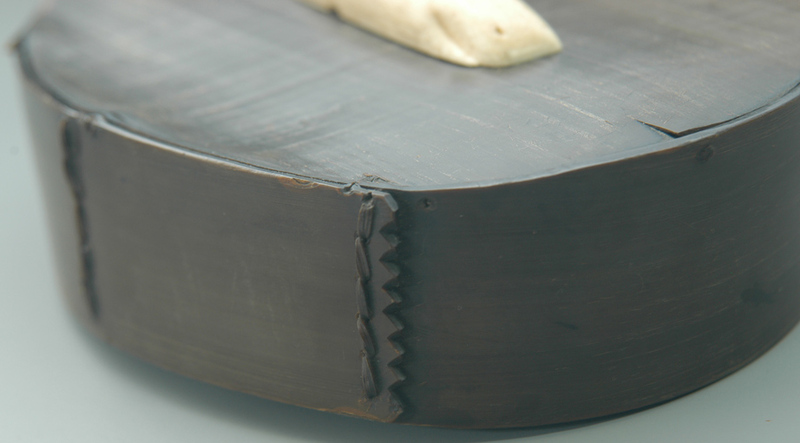 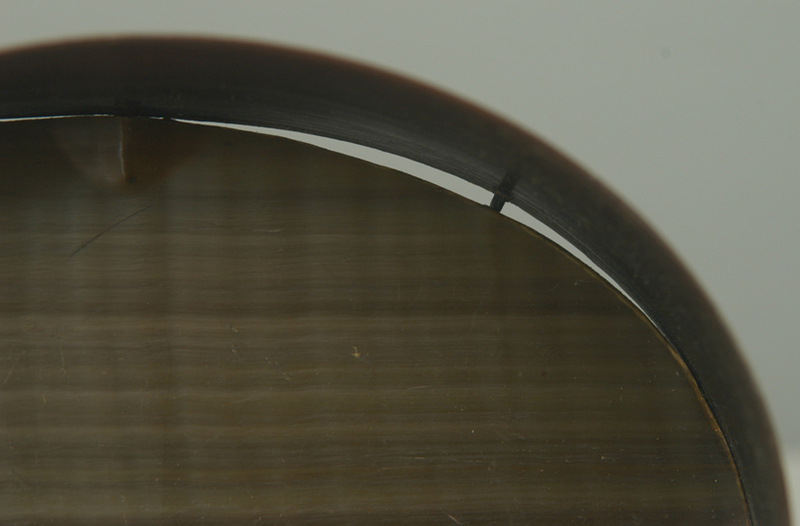 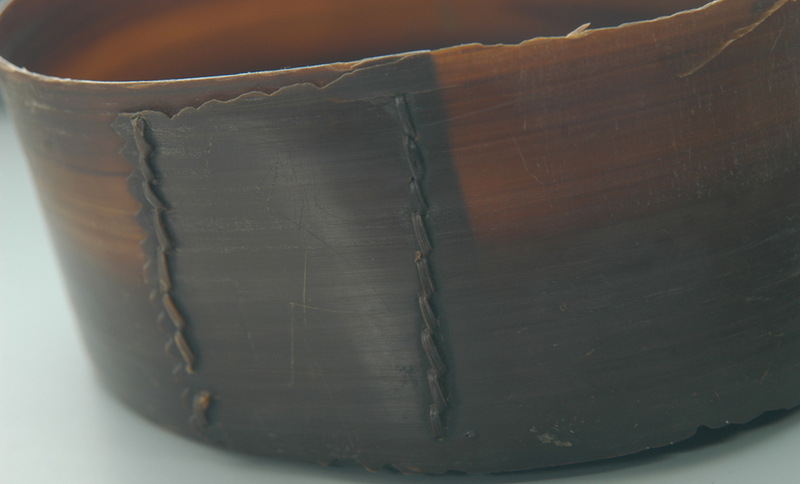 The ends of the baleen used for the sides is serrated, which adds to the beauty. 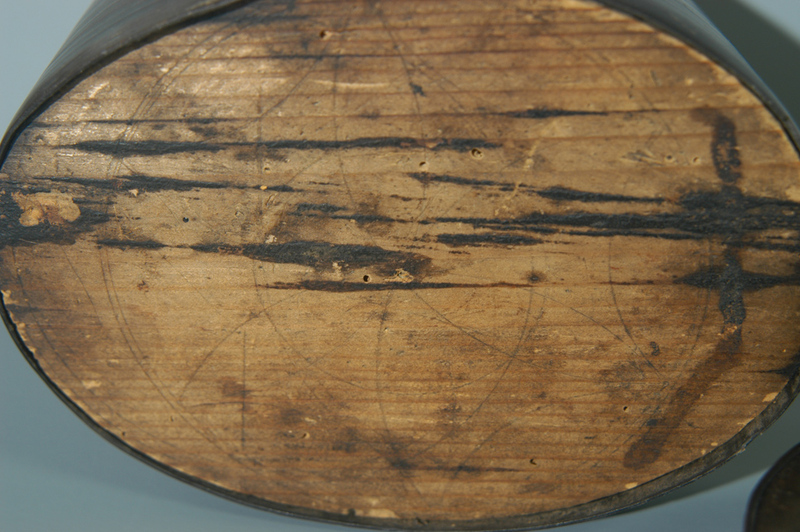 The bottom of the box is wood and has intersecting circles drawn which give the impression of a compass. 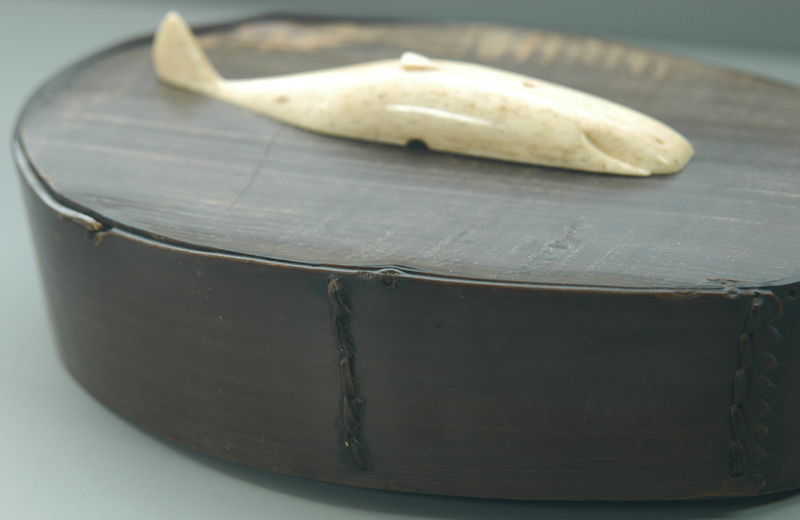 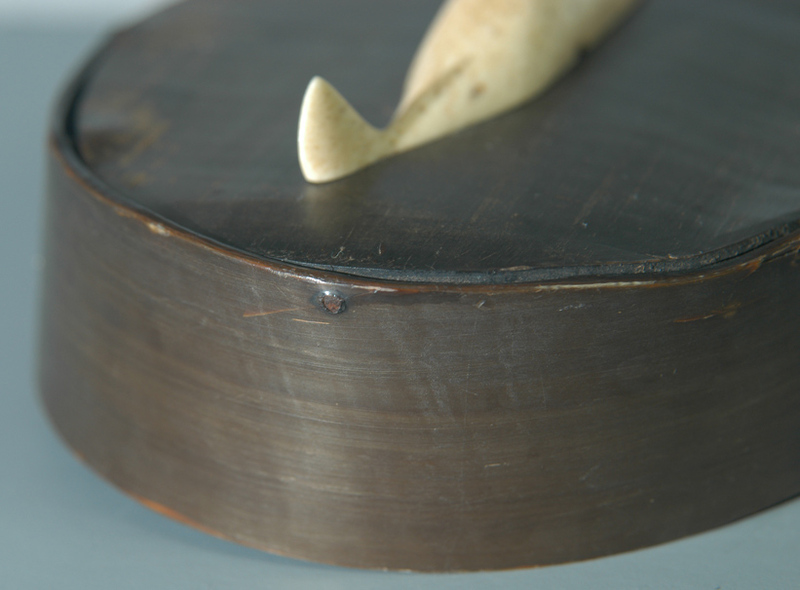 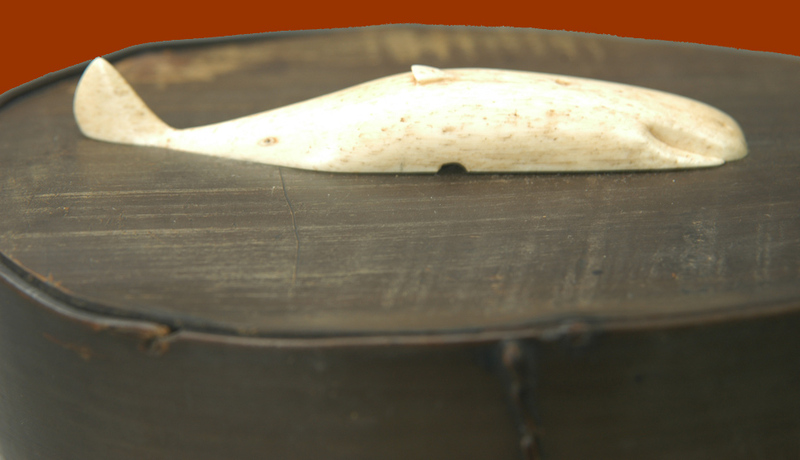 The top of the box is graced with a naïve carving of a sperm whale, likely carved from whale bone. 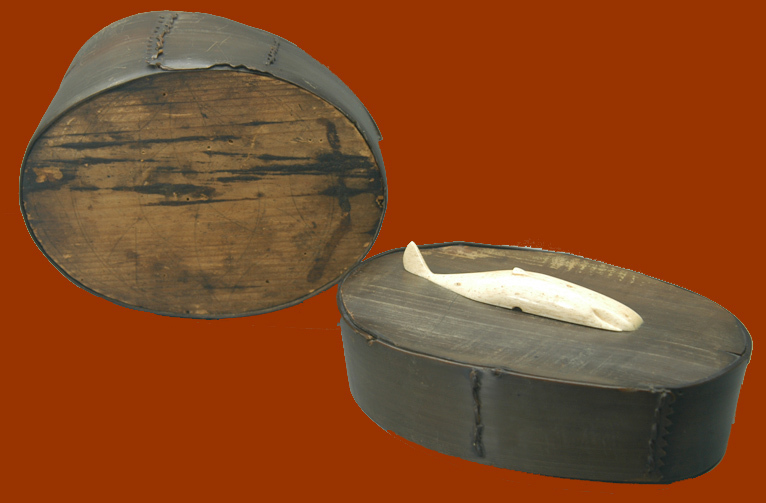 The box is quite wonky as it has warped with age. 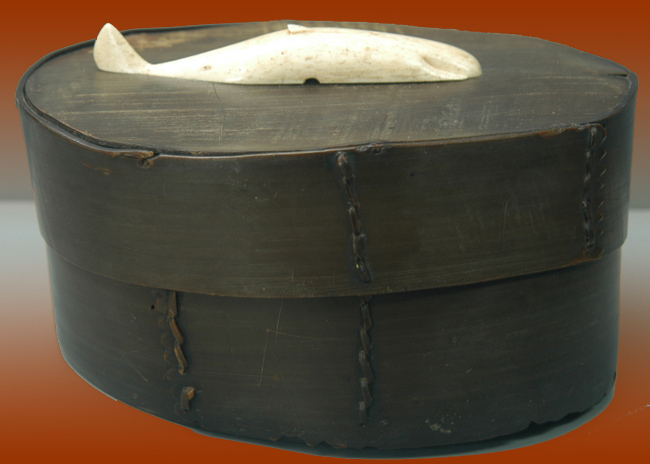 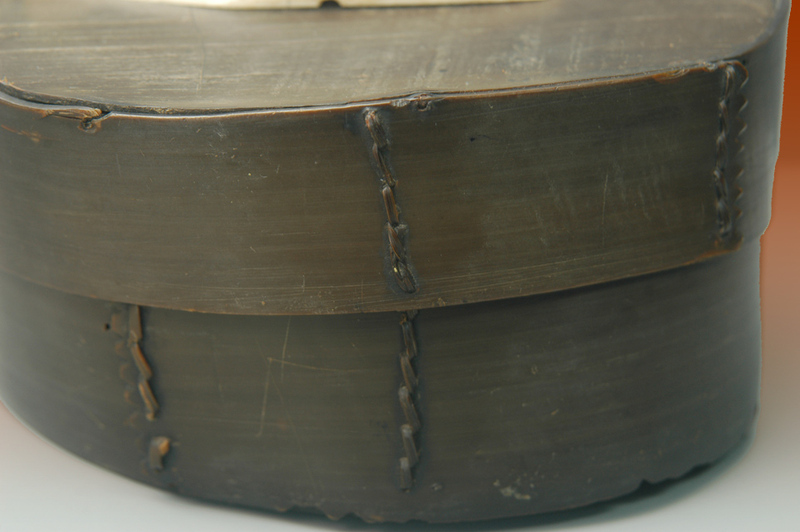 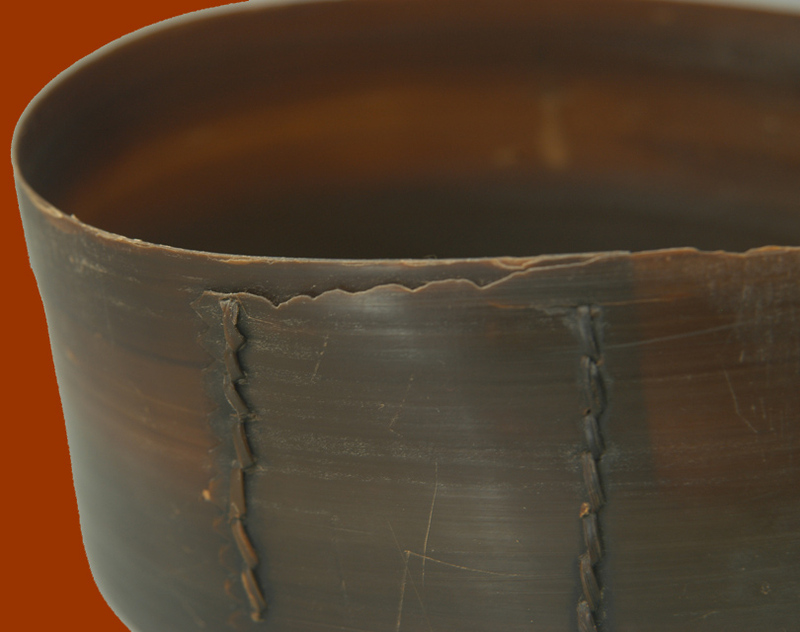 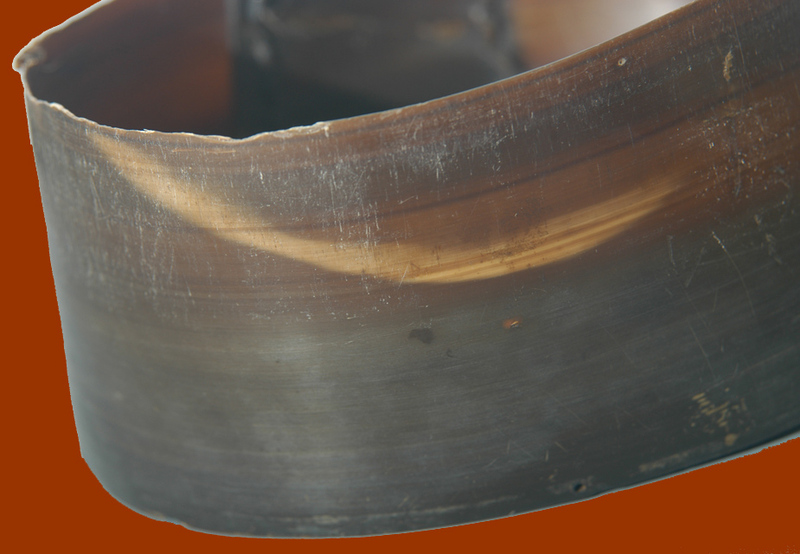 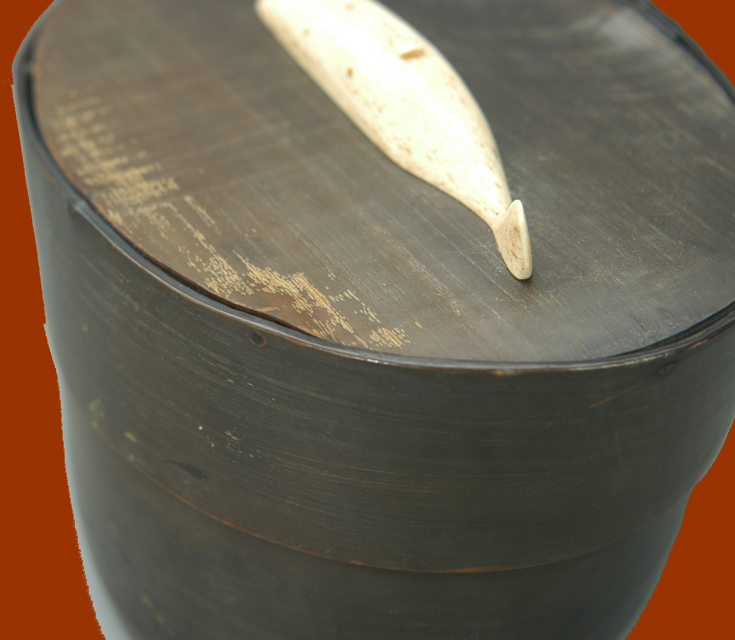 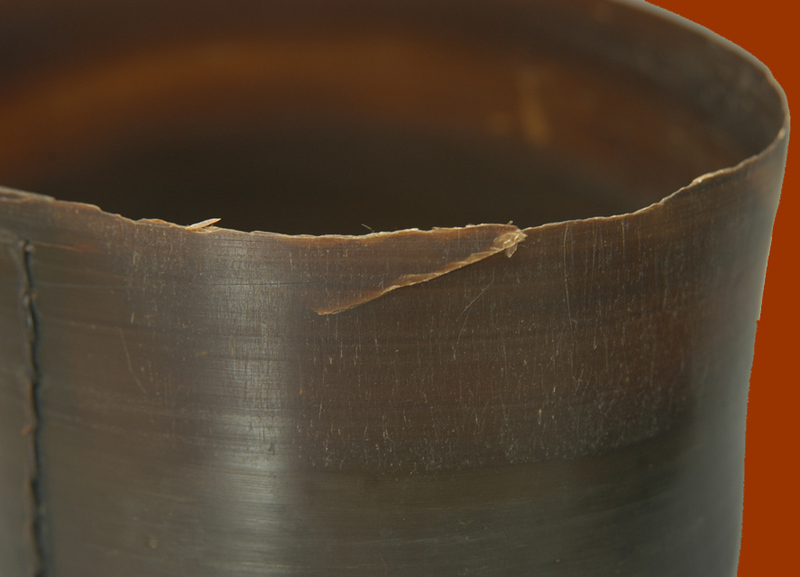 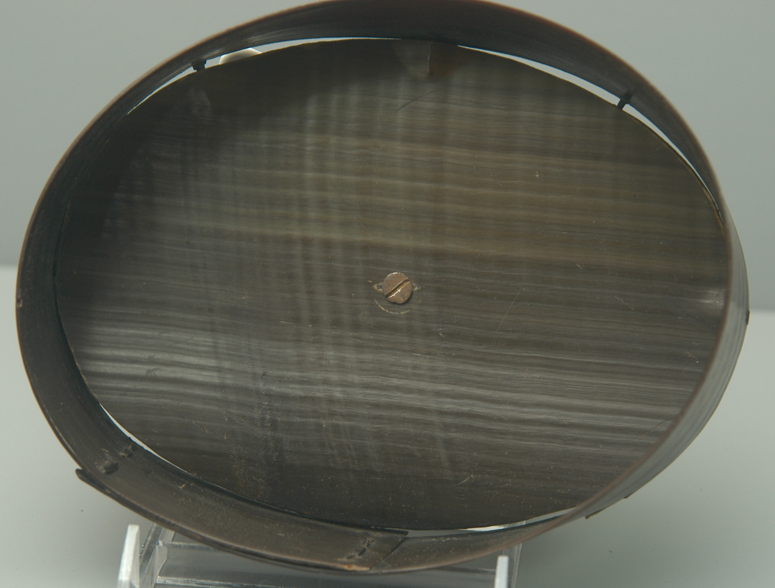 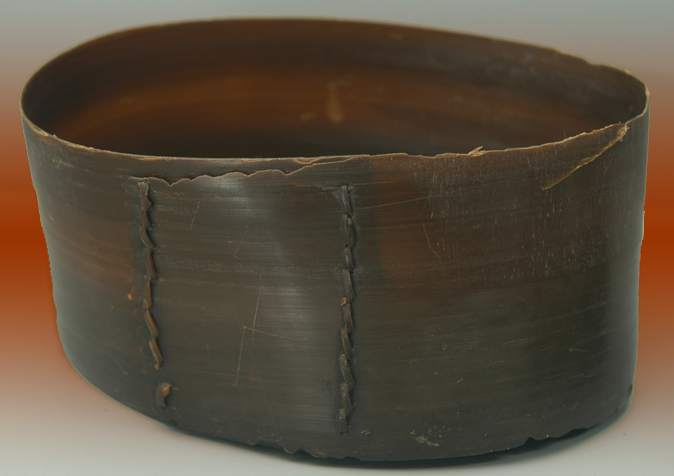 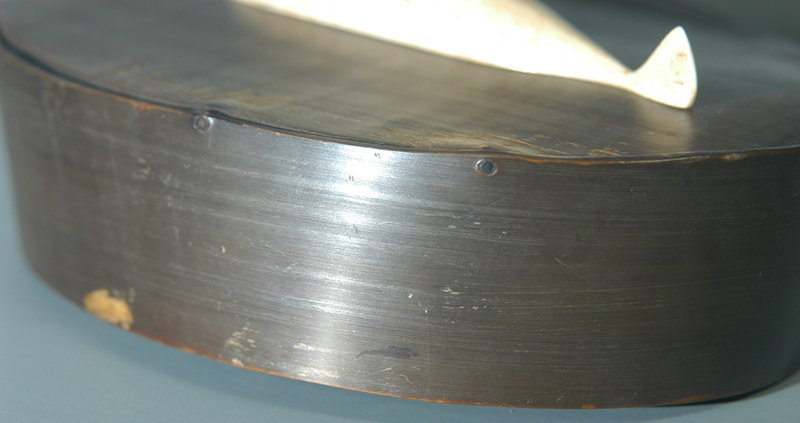 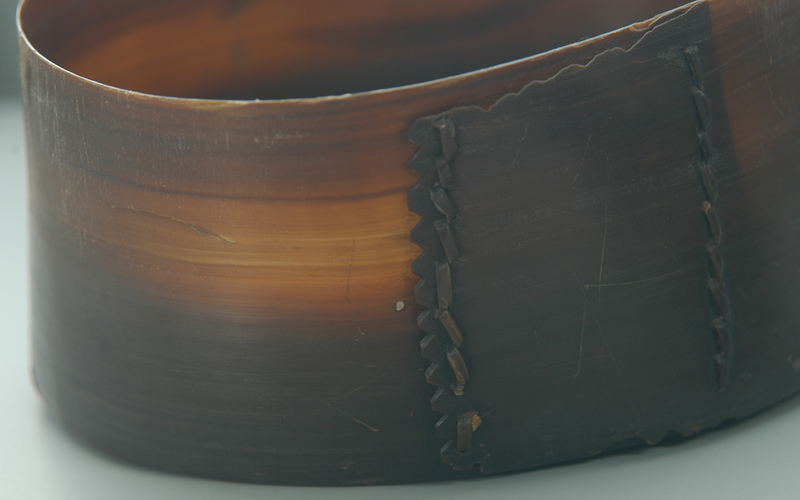 We all know that turned wood ages "out-of round" and this, essentially is what this baleen box has done. 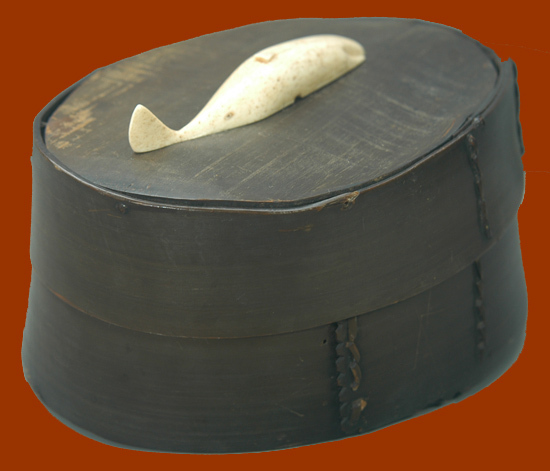 Baleen warps easily as it ages and I really love the wonkiness of the shape of this box. 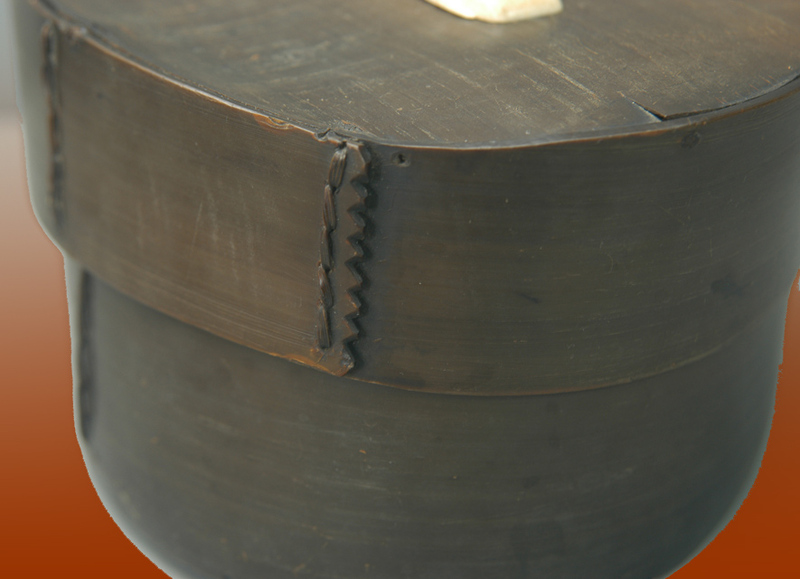 Luckily, the top and bottom have changed shape together and the top and bottom still fit quite well and the top can still be removed. 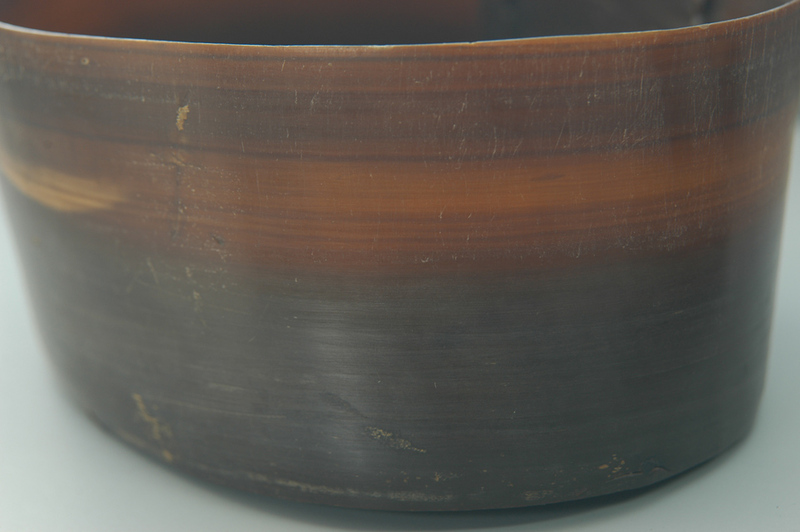 Once the top is removed, the light shows through the sides so that you see all of the lovely colors of the baleen. 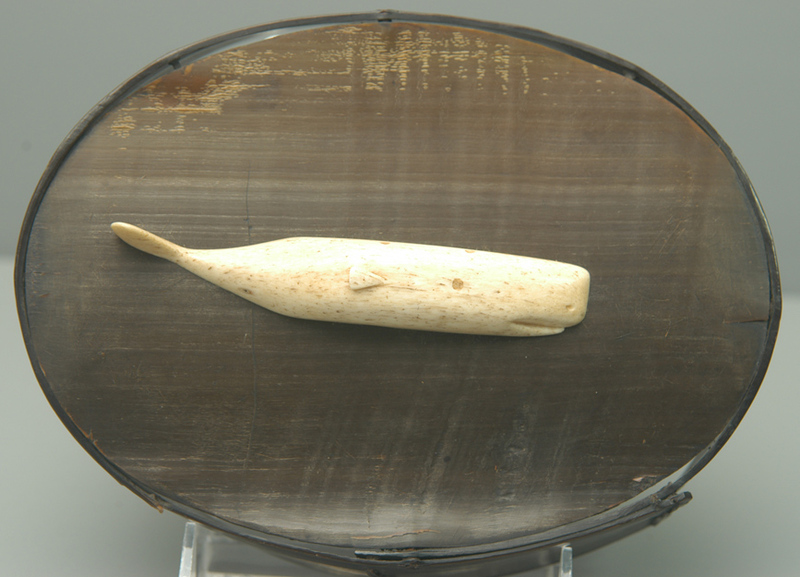 The carved whale is attached to the box with a 19th century flat-head screw. 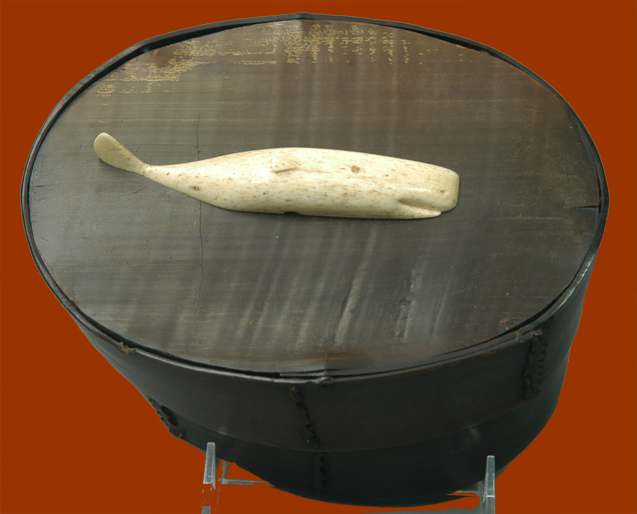 At the bottom of the whale's body is a drilled half-circle, which I believe was made to assist in holding the whale in place while being screwed in from below. 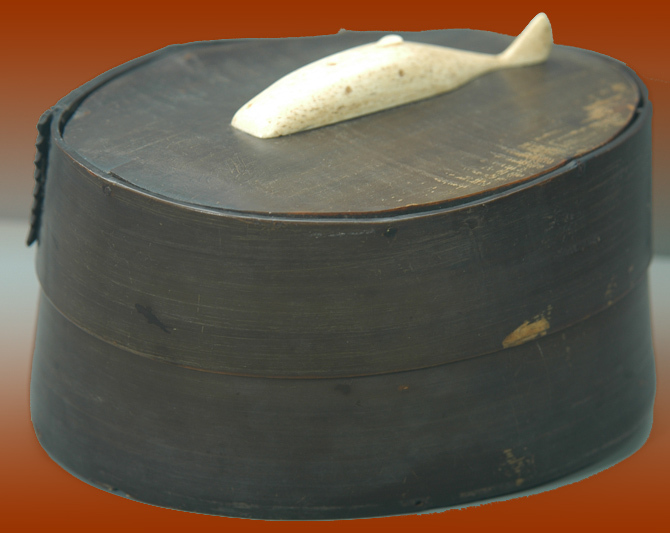 The box measures about 7 1/4" x 5 3/8" x 3 5/8" tall. 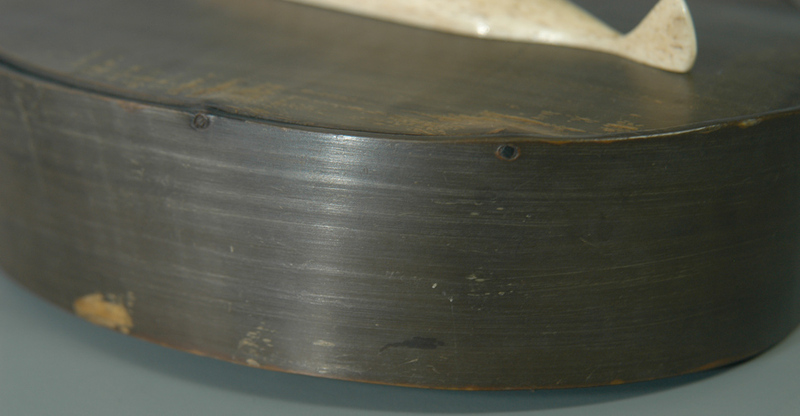 There are separations where the sides meet the top and bottom. 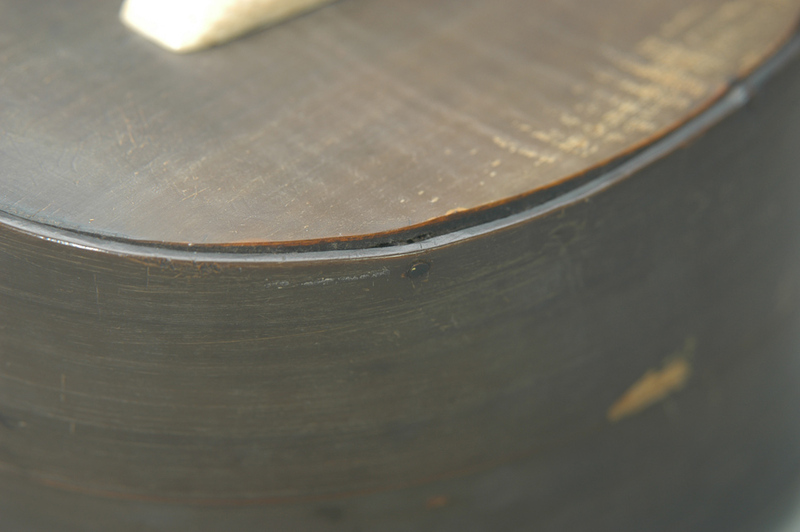 The side has a crack at the inside top which you can see in one of the photos on page 2. 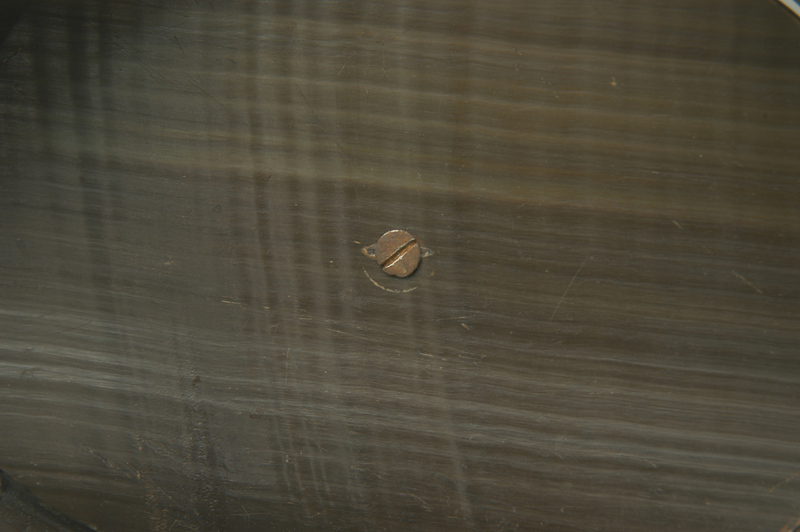 There is a small, slightly lifted crack at edge of the top (also seen in detailed photos). 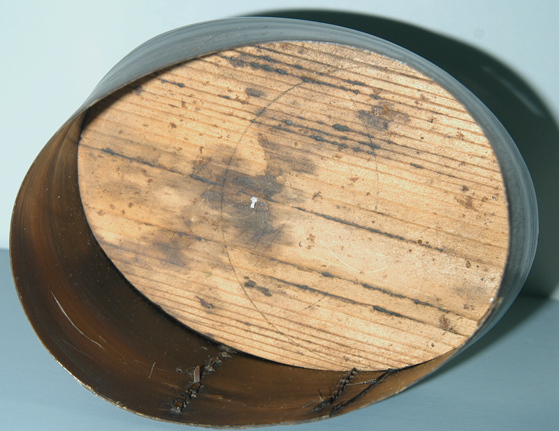 Various, non-intrusive scuffing of the baleen.